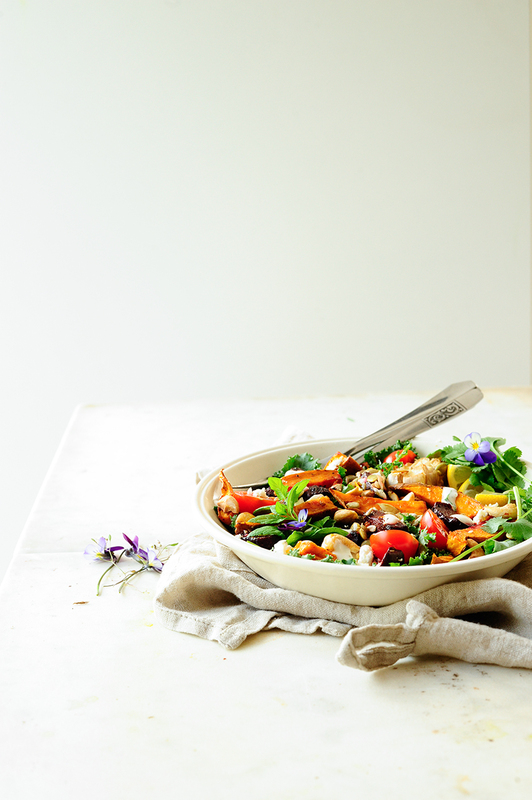 This colorful salad is full of so many vegetables and wonderful flavors, it’s my weekly lunch and usually this salad keeps me company at work and I still can’t get enough of it. It’s packed with plenty of lentils, roasted beetroots, sweet potatoes and nuts. Super easy, healthy and topped with a creamy yogurt dressing. This kind of salad brightens my day and I love it, do you? 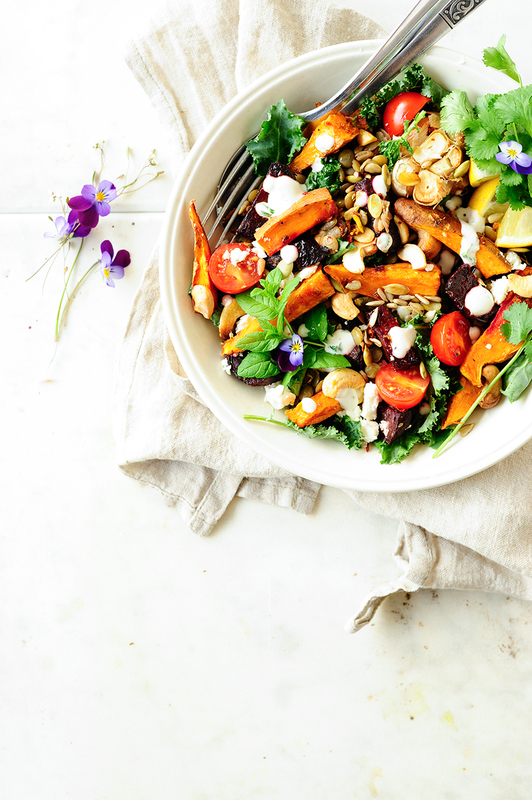 Place the beets and sweet potatoes in a bowl and drizzle with oil. Add turmeric, ginger, cumin, lemon juice, garlic and cayenne pepper and season with salt and pepper. Toss with your hands and spread onto a baking sheet in an even layer. Bake for 15 minutes at 200°C. Flip, add nuts and seeds, bake for 15 minutes more. Bring salted water to a boil, add lentil and simmer until tender, drain. Combine all the ingredients for the dressing. 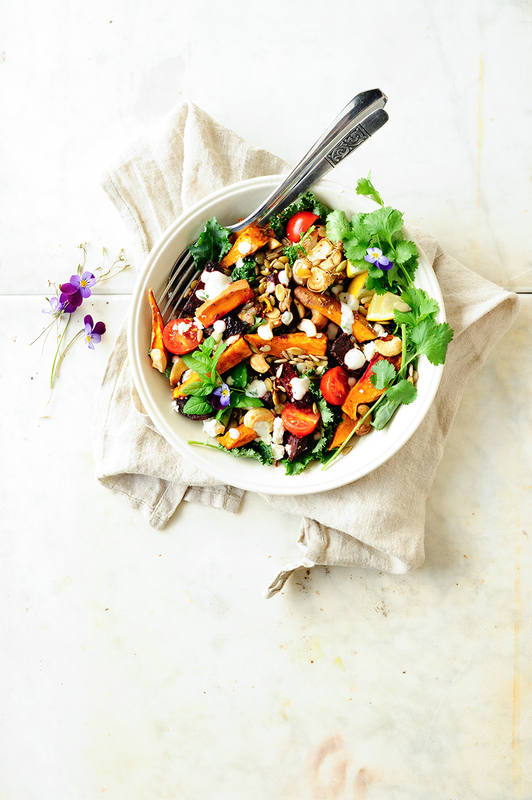 In in a large salad bowl, toss together the kale, beetroots,sweet potatoes, apple, tomatoes and lentils. Crush the feta, season with salt and pepper and serve with the yoghurt dressing. Enjoy!